Voila New Callysta is a lightweight, classic, vintage, elegant women’s genuine leather bag made of 1.3 mm thick, premium oily pull up cow leather with marble / crack texture accentuating its leather strokes – a perfect companion for you going to the office or just hanging out with friends, family, and relatives, suitable matched with office / business attire, feminine fashion, even casual outfits. 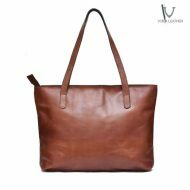 Voila Leather once again launch a classic tote bag series named Voila New Callysta – a medium sized women’s bag with more elegant new design in new color varieties, elegant classic brown, blue denim, and red wine. Voila New Callysta is designed classy, elegant, simple, handmade by our experienced leather craftsmen using different leather type from the previous Callysta. Voila New Callysta is made of 1.3 mm thick, premium oily pull up cow leather with marble / crack texture accentuating its leather strokes. 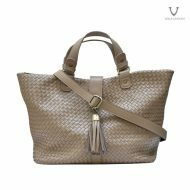 Voila New Callysta design is similar to the previous serie with two shoulder/hand-carry straps and leather piece stitches on the upper corner right and left side complementing its frontside design. Voila New Callysta also completed with sling / crossbody strap for an options on how you would want to carry the bag. Voila New Callysta spacious interior is wrapped with elegant, soft, smooth velvet suede fabric lining for your valuables safekeeping, and it is completed with a zippered pocket. Voila New Callysta Women’s Genuine Leather Bag looks sturdy on the outside but soft on the inside, perfect for classy personality – a classic, vintage, elegant tote bag for your companion to the office, or just hanging out with friends, family, and colleagues – suitable matched with feminine fashion, office / business attire, or even casual outfits. If you are looking for a classy, classic, simple genuine leather bag made of thick and strong leather, Voila New Callysta deserves a spot in your bag collection shelf.